And that's basically how a goofy project was born. 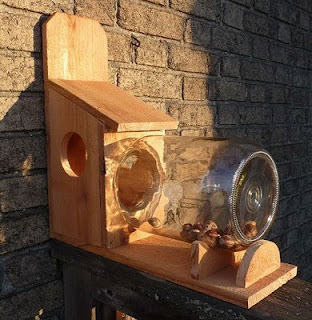 Now I have this squirrel feeder for entertainment! No I don't want 50 squirrels hanging around, but they are fun to watch from time to time. I haven't attached this one yet because the instructions call for making an access hole in each side of the feeder, but I think I make another one with only one hole on my viewing side. The video of the squirrel entering the feeder is right after I blocked the hole on the other side. That's why he seems a little confused. The little grey squirrel is not timid at all. He learned quickly that I would give him nuts without harm. The black one however has not gotten that friendly. I picked up a bunch of acorns on my route too so I have lots of free nuts for my amusement. I do have to look into getting peanuts though since the blue jays and cardinals will come along and eat the shells that the squirrels leave behind. 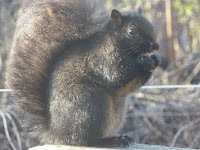 The squirrels like bread too and they usually stick around and eat that where as the nuts they disappear to bury it.